The perfect card for your best friend - a great way to say happy birthday, thanks, or a reminder of how brilliant they are. No matter what life throws at you both, you know you’ll always have each other to get you through. 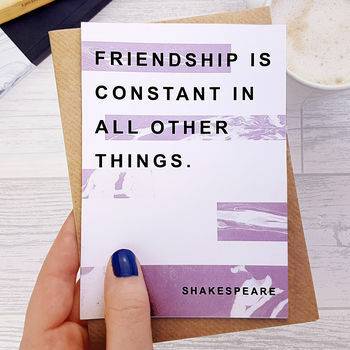 This card uses a wonderful quote from the fantastic William Shakespeare. This lovely, literary greeting card features bold, eye catching text over a beautiful purple marble effect .